The nice thing about this approach is that even if everything runs as smoothly as possible, having a little extra time isn’t the worst thing. A wedding day is usually pretty long and hectic, and many brides and grooms spend most of it dealing with family members, making sure everything is taken care of or rushing from one place to the next. Unfortunately, they often don’t get that much time to just enjoy being with each other. A looser schedule can frequently provide bits of much-needed alone time that allow future spouses to relax and recharge. What we love about not having to race around on a wedding day is that it gives us more time to do our favorite thing: taking photos! When a couple is short on time, their wedding photographers often don't have much more than a few minutes to take a portrait or two of the lovely newlyweds before they are whisked away to the reception venue. Don’t get us wrong on this! We are professional photographers, we love what we do and we only need a couple of minutes to produce images that you and your future husband or wife will treasure for a lifetime. But we have found that some of the most fun pictures (and those most valued by our wedding clients) are the ones that we take near the end of the time allotted for couples portraits. By that point, the couple is a bit more relaxed and less aware of the camera, making the shots much more natural and unposed. We have also already finished taking the “safe” shots that can go in a photo album or on a mantel, so there is more freedom to play around and try for some more creative and fun pictures. 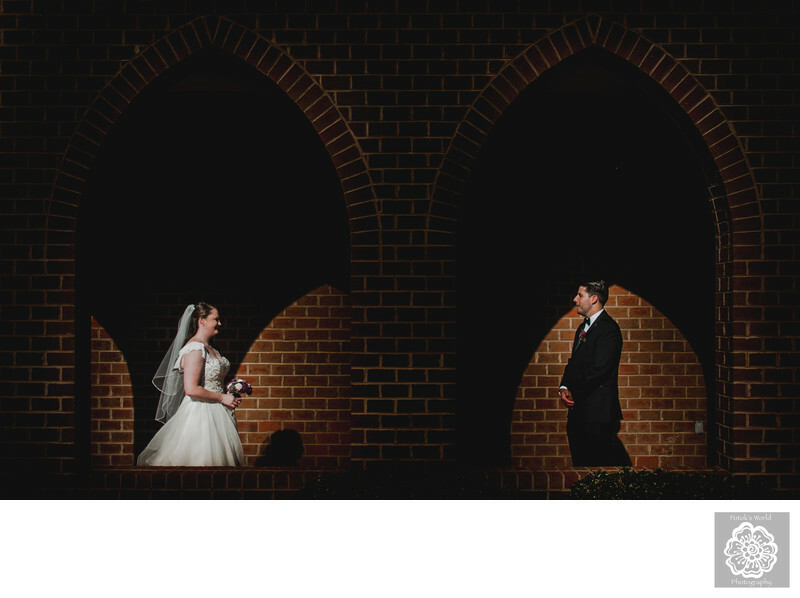 This photo, which we took outside St. James the Greater Catholic Church in Charles Town, West Virginia, is a perfect example of what is possible when your wedding photographers have more time to work with. We had already finished with the family formal pictures and some of the couples portraits back at the Crown Rose Estate in Knoxville, Maryland (where the bride and groom had gotten ready). We had a bit of time before the wedding party had to be back at the Crown Rose for the reception, so we asked the new husband and wife to try out a few new poses. The one we like best was this, in which the bride is captured on film as she appears to pass through a series of arches on her way to her groom. We find the symmetry of the two arches very visually pleasing and absolutely love the joy on each of their faces! Location: St. James Catholic Church, 49 Crosswinds Dr, Charles Town, WV 25414.